Exciting SFR news! 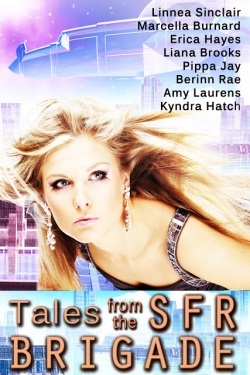 TALES FROM THE SFR BRIGADE is a new and *free* e-anthology of science fiction romance stories! It's currently available from Smashwords. * A space captain discovers the cyborg she loves just might be her greatest enemy. * A mind-wiped prostitute risks all when she recruits a dangerous stranger to help her escape a terrible fate. * A prisoner-of-war confronts the comrade who loved her, then left her for dead. * A space-obsessed physics teacher is kidnapped by a far-too-charming alien. * An apocalypse survivor battles the biomech-enhanced hunter who seeks to capture her. * A young artist must choose between her comfortable life on Earth or a war-torn space colony with her beloved. * A daring thief is on the run from the alien law man who is determined to bring her to justice. * A widowed rebel leader tries to save the last remnants of humanity, one stranger at a time. Did I mention this anthology is free?! Download TALES FROM THE SFR BRIGADE today!